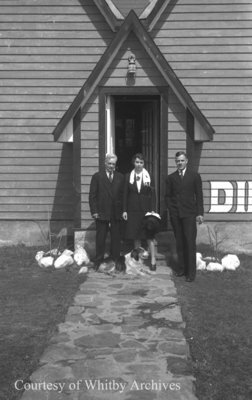 A black and white negative of three unidentified Ruddy family members standing in front of the Byeways Lodge. In this view the unidentified woman is holding her hat and the dog is lying in front. Byeways Lodge, April 21, 1941, Marjorie Ruddy. Whitby Archives A2013_040_750C.